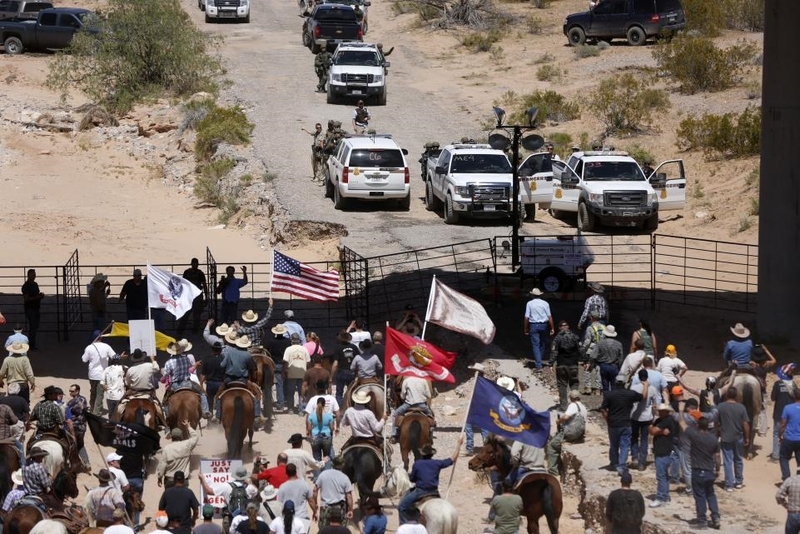 PHOENIX — A federal judge in Las Vegas ordered prosecutors in the Bundy Ranch standoff trials to turn over an investigative report accusing a key government witness of wrongdoing. Navarro said prosecutors had a duty to release a full copy of a report by the Department of Interior’s Office of the Inspector General naming the agent, calling it “material evidence” that could be used to impeach the government’s witness. The inspector general’s report made public Jan. 30 did not name the agent. But attorneys for the defendants said it contained enough details to positively identify him as Dan Love, the BLM special agent in charge of Utah and Nevada between 2012 and 2015. He said the report could be used to show Love’s pattern and practices of misbehavior. He said federal investigators for years have been aware of Love’s wrongdoing and chose to hide it even as trial commenced. “It gives value to our concern that there was government overreach,” he said. The inspector general’s report cites ethical violations that occurred in 2015 at the annual Burning Man event in Northern Nevada’s Black Rock Desert. An analysis by the Reno Gazette-Journal and The Arizona Republic found many details in the report coincide with Love’s career, including the agent’s former title, his base of operation, his past assignments and his on-site supervisor. In addition, the report cited a June 2015 Gazette-Journal story about complaints against Love over his conduct before Burning Man began. The U.S. Attorney’s Office and Bureau of Land Management officials in Washington, D.C., have declined to comment. For two decades, the BLM repeatedly ordered Bundy to remove his cattle from federal lands near his ranch about 80 miles north of Las Vegas on Interstate 15. The BLM obtained a court order in 2014 to seize Bundy’s cattle as payment for more than $1 million in unpaid grazing fees. In April, the BLM, led by Love, implemented a roundup of 1,000 head of Bundy’s cattle ranging on public land. The standoff was hailed as a victory by militia members. Cliven Bundy’s sons, Ammon and Ryan Bundy, cited their success at Bundy Ranch in their run-up to the siege of an Oregon wildlife refuge in 2016, also in protest of BLM policies. An Oregon federal jury acquitted Ammon, Ryan and five others in October. “Given the only very recent release of the OIG Report, the government’s failure to disclose it falls well short of outrageous,” she wrote. The US Government has been moving in the wrong direction for quite some time but never as bad as the last eight years. The over reach of the BLM , the criminal Conduct of people like Harry Reid, Hilary Clinton, Barack Obama and other public Officials. If they thought the Bundy Ranch was an inserection then they will be totally flabbergasted at the next time Civilians have to come to the rescue of another American being bullied by an over reaching government agency or agent. The election of Donald Trump says it loud and clear that we the people are fed up with the kind of crap shown towards the Bundy’s then and still going on. At least there is a judge that I think has a good idea of what has been happening. They know. It is just a matter of what side of the fence they are on.